One day after Republican candidate for governor Debra Medina’s insurgent campaign hit a speed bump, she’s striking back. After comments on Glenn Beck’s radio show Thursday that seemed to support 9/11 conspiracy theories, she says she was set up by her opponents. Glenn Beck interviews/attacks Debra Medina/911 Truth movement: Candidate Medina fails to take a firm stand---or even make her position crystal clear--- on 911 Truthers. In a major failure to explain herself, she leaves Mr. Beck and his staff laughing as he brushes her off the phone line. 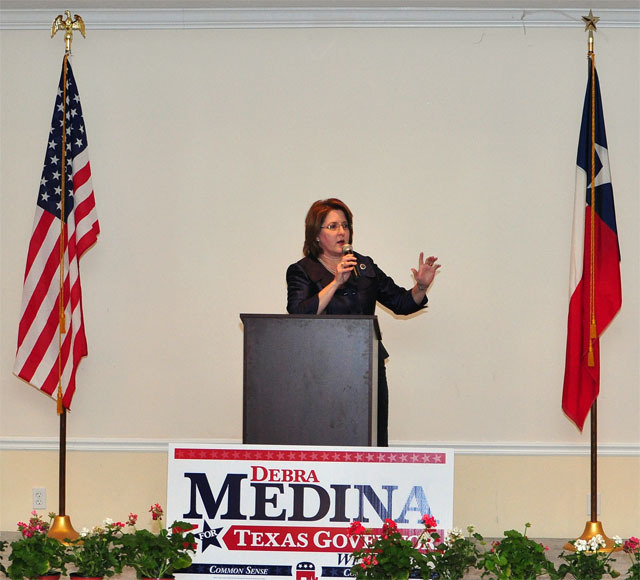 Alex Jones, one of the supporters of candidate Medina, must be disappointed that Debra Medina---whom is normally a strong & vocal individual--- so weakly stood up against Mr. Beck on the 911 Truth issue. Maybe it's time for Mr. Jones to challenge Mr. Beck to a one-on-one debate. Gov. Rick Perry and Sen. Kay Bailey Hutchison are dismissing a suggestion from a Republican gubernatorial primary rival that the U.S. government was involved in the 9/11 terrorist attacks. Appearing on the Glenn Beck Show, Debra Medina said there were "some very good arguments" that the U.S. was involved in bringing down the World Trade Center on Sept. 11, 2001. Medina, Perry and Hutchison are battling for the GOP nomination. Perry said Medina's remarks Thursday "were an insult to the thousands of Americans who lost loved ones." He countered that anyone "should be ashamed" for suggesting involvement by former President George W. Bush's administration. Bush was Perry's predecessor as Texas governor. Hutchison stressed that it was "al-Qaida terrorists who declared war on America. To suggest otherwise is an affront to the men and women who are sacrificing their lives to root out the terrorists in Afghanistan and around the globe."